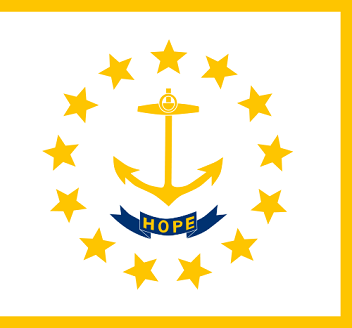 The distinctive shape and colors of State Flag of Rhode Island depicts the central image of an anchor, symbolizing hope, surrounded by a circle of 13 gold stars representing the 13 original colonies. 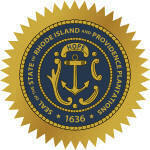 The Rhode Island flag serves as a symbol of honor, heritage and regional pride and is displayed at state buildings. There is a strict Order of Precedence for flags. State Flags are displayed in order as they entered the Union. Car Flags are often displayed to represent of an individual's allegiance to their state. Rhode Island State car flags are used by their owners as mobile emblems of their home. Car flags are usually made from strong materials and are attached to a car via a pole and clip window attachment. What is the design of the Rhode Island state flag? What does the anchor symbolize? In heraldry the anchor is a symbol of good luck and of security, and therefore of trust and confidence. The anchor is the Christian emblem of hope, refuge and religious steadfastness. The ratio is 1:1 meaning it is 1 unit tall for every 1 unit wide. Who designed the Rhode Island State Flag? What is the history of the Rhode Island State Flag? 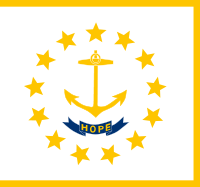 1664: The word "Hope" was placed over the seal's anchor and adopted by the Rhode Island General Assembly for the State of Rhode Island Providence Plantations. "I pledge allegiance to our State Flag, and to the Republic of which Rhode Island forms a part; one Union inseparable, with honor and reverence for both State and Nation"
The Rhode Island flag is kept and used as required by the code specified in the constitution of the state.